Put cereals in a bowl. Add 1 tsp Maca- and Lucuma powder into the milk or almond milk and stir. Then put the milk-mix into the bowl. Soak the muesli for about 10 minutes. Meanwhile, peel bananas and cut into slices , wash blueberries . 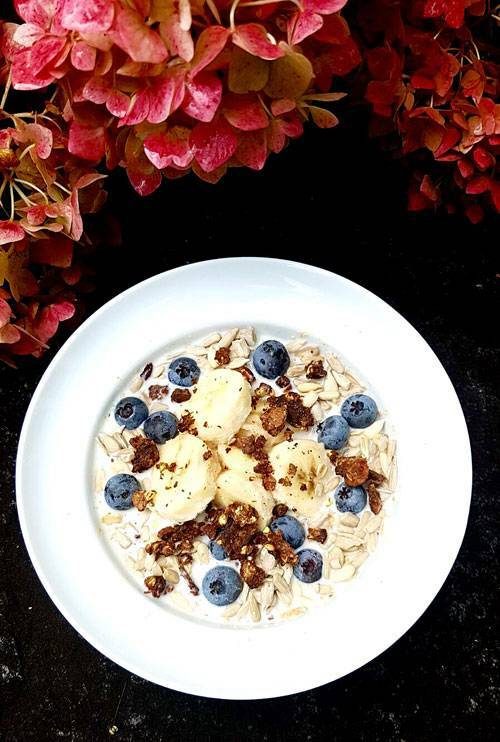 Add them decoratively together with sunflower seeds and Cocoa Granola ……Happy Breakfast! This muesli bowl is a delicious and easy to make and serve breakfast, with a high nutrient content, too. BANANAS help to overcome depression due to high levels of tryptophan, which is converted into serotonin - a happy-mood brain neurotransmitter. They are also very nutritious and score with their minerals potassium and magnesium, good for athletes avoiding muscle cramps and getting more energy for a workout. Potassium and a low level of salt also helps to lower blood pressure and protects against heart attack and stroke. Bananas strengthen the nervous system and help with the production of white blood cells, due to high levels of vitamin B6. Iron helps to strengthen the blood and relieve anemia. Incidentally , the more mature they are , the faster the carbohydrates are available to the body . For digestion the yellow fruit is also good, as well as apples as they contain pectin which absorbs too much water when affected by diarrhea. 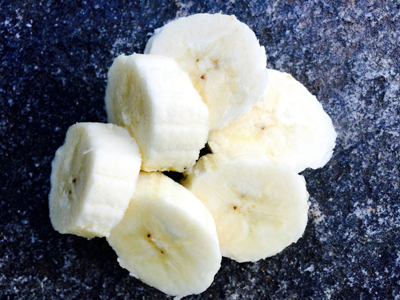 And when affected by constipation bananas help to stimulate digestion. BLUEBERRIES are rich in vitamnis such as C and E and beta-carotene. Especially the blue dye myrtillin which is part oft he anthocyanins, builds up blood, is cytoprotective together with vitamin C and iron and ensures elastiv blood vessels, which is a benefit for the heart and circulatory system. In addition, this natural dye neutralizes free radicals and has thus a preventive effect on chronic diseases and can affect the aging process positively. For example Blueberries can improve memory and slow down cognitive problems coming up with aging, as a study in 2010 has shown. Blueberries also contain detoxifying cathechin tannins und thus help in case of diarrhea. They protect the irritated mucosa and inhibit the growth of viruses and bacteria. 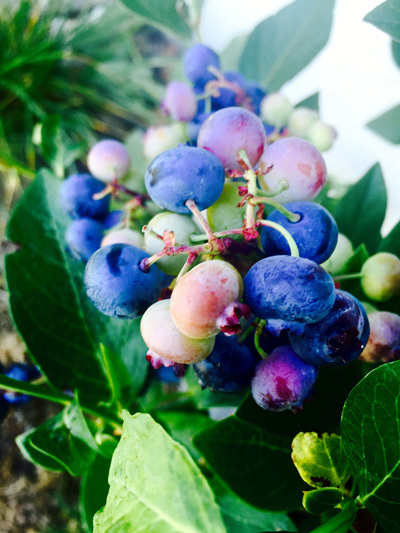 These blue berries are high in fiber and are thus already good for digestion. Blueberries have also a lot of minerals and trace elements to offer such as calcium, chlorine, potassium, magnesium, sodium and phosphorus and sulfur, flurorine, iodine, copper and manganese and zinc. In general they are considered low in terms oh their glycemic index and have therefore a positive effect on blood sugar regulation. Here you find an in-depth nutrional profile. For more health benefits of blueberries and recipes check out here. COCOA GRANOLA can be prepared in every conceivable form. 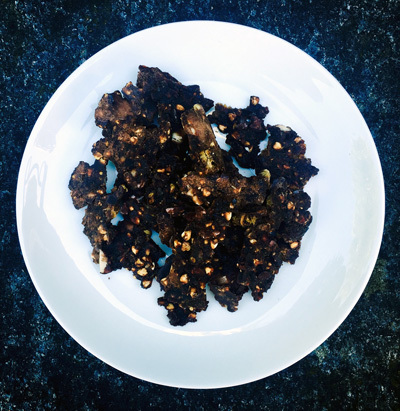 Nuts such as almonds , sunflower seeds or walnuts, eventually mixed with chia seeds and flaxseed, are mixed with dark chocolate and honey and baked in the oven. You can find numerous recipes for incredibly delicious Cocoa granola in the internet. Just try! Nuts and dark chocolate are known to be rich in nutrients. Incidentally, there is a difference between Cacao and Cocoa. Cacao is the purest form of chocolate that can be eaten. It is raw and is less manufactured than Cocoa powder. Cacao offers more antioxidants and much more magnesium. It also has more fiber and calories than Cocoa powder because it contains more nutrients due to the manufacturing process. Cocoa powder is produced similar to Cacao. The difference is that it is heated at higher temperatures during the manufacturing process. However there is still a large amount of nutrients left that help the cardiovascular system, is good for your skin and - your stress levels. 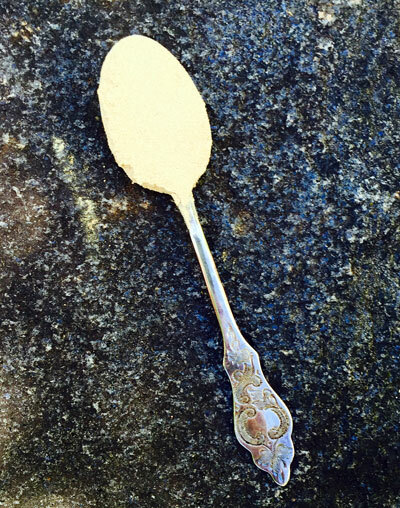 LUCUMA is a delicious and healthy sugar substitute - and even low-calorie and it has a low glycemic load. Good for diabetics because blood sugar levels after eating Lucuma rises only slowly. The fruit is high in nutrients . You can find proteins, fiber, calcium and iron, potassium, magnesium, phosphorus and zinc, beta carotene, vitamin B1, B2, B3 and vitamin C.
It acts as a good source of energy, revitalizes and has an anti-inflammatory and digestive action. MACA powder is similar in nutrition to wheat, rice, and maize. It has a high content of essential fatty acids and provides iron and calcium, magnesium and phosphor, potassium and sulphur, sodium, zinc, iodine, copper, selenium, bismuth, manganese, tin, and silicon. It also contains vitamins B1, B2, C, and E.
61% of organic Maca powder consists of carbohydrates, 12 % protein, 8.5% fiber, and 2.2% lipids. This means that Maca has a higher fat content than other root varieties. Maca is rich in immune boosting phytosterols, which have a positive impact on cholesterol levels. 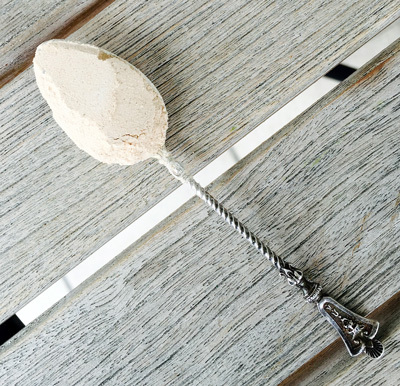 The maca plant, unlike soy and yam root, does not contain any phytoestrogen. A study in 2006 showed that Maca serves well as a substitute for hormone therapy. Maca helps to alleviate symptoms of altitude sickness, as it supports oxygen absorption in the blood. Its high content in calcium – more than milk or in any other similar plant – is supposed to impact osteoporosis positively. SUNFLOWER SEEDS contain many nutrients like minerals and trace elements calcium and iron, potassium and a lot of magnesium, phosphorus and zinc . Vitamins of the B group such as B1, B2, B6 can be found as well as vitamin E, folic acid, pantothenic acid, biotin, retinol, carotene and niacin. Their proportion of unsaturated fatty acids is very high, at over 90%. The body needs these nutrients urgently for a functioning metabolism, the formation of bones and teeth, the oxygen transport in the blood and thus for the energy level and the activation of many enzymes, for the electrolyte balance and much more. 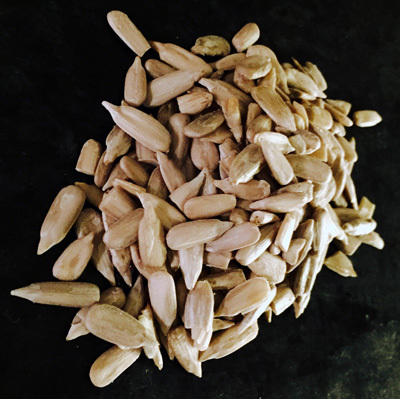 In particular, the cell protective vitamin E is abundant in sunflower seeds. These small seeds score with a high protein content more than in a steak - and are therefore a good source of protein for vegetarians and vegans .